Professional Mold Inspectors use this tool to look for trapped moisture behind walls, floors, and ceilings to locate hidden mold – now you can, too! REMEMBER: MOLD IS CAUSED BY WATER – FIND THE WATER, AND YOU HAVE FOUND THE MOLD! The easiest way to find trapped moisture is with a Moisture Test Meter. With this simple tool, homeowners and do-it-yourselfers can quickly locate hidden mold behind the walls, floors and ceilings. 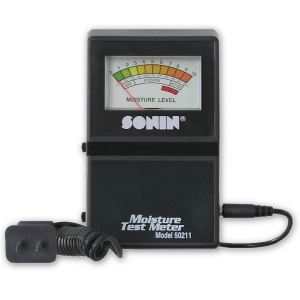 The Sonin Moisture Test Meter uses a dual reading analog scale, giving relative (1-10) and moisture percentages 10-28% readings to alert users to possible mold and moisture problems. This tool is especially valuable for anyone who is looking for mold, or getting ready to paint, wallpaper, stain a building surface or deck, or lay carpet or tile. The Sonin Moisture Test Meter is the number one selling product of its kind in terms of unit sales. It retails for nearly a third of the price of comparable models. A great tool for the professional contractor, inspector, or homeowner who needs an extremely affordable and accurate moisture-testing product. This unit will detect moisture in a range from 10%-28%, and has an easy to understand analog gauge.